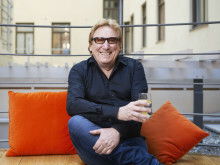 Stockholm, Sweden, January 23, 2019 – Bluewater, a world leader in innovative water purification technology and solutions, today hailed the Volvo Ocean Race science programme winning top Ocean Tribute Award for groundbreaking efforts to understand ocean health as a further demonstration of the power of sport to be a force for environmental good. The efforts to better understand ocean health by collecting scientific data during the nine-month round-the-world yacht race in 2018 were praised as ‘groundbreaking’ at a ceremony in Dusseldorf where the Ocean Tribute Award award was handed over to Anne-Cecile Turner, Race Sustainability Programme Leader. 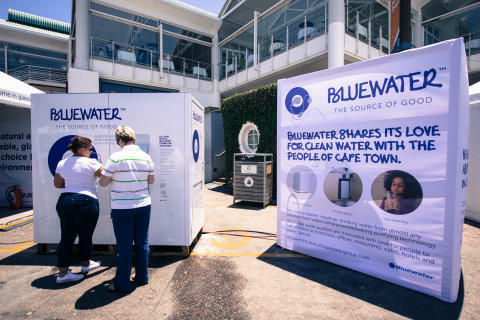 Bluewater was a main sustainability partner of the 2017/2018 Volvo Ocean Race alongside other partners such as Volvo, the Mirpuri Foundation and 11th Hour Racing. “Being recognised by the prestigious Ocean Tribute Award for helping to increase scientific understanding of the impact plastic pollution is having on ocean health is a powerful demonstration of the power of sport to be a force for environmental good,” said Bluewater President and Chief Strategy Officer Anders Jacobson. The award is the third major accolade for the Volvo Ocean Race programme, which has earlier won the ‘Sports CSR Campaign of the Year’ category at the International Sports Awards and the ‘Best Corporate Campaign or Initiative in Sport for Good’ category at the Beyond Sport Awards. 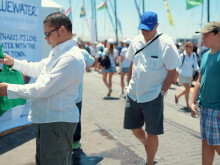 Bluewater, which has put battling single-use plastics at the heart of its business mission, provided unique hydration stations at each Volvo Ocean Race stop-over village to provide pure water to visitors and draw attention to high levels of pollution of drinking water around the planet. “The Volvo Ocean Race played a key and decisive role in drawing public attention to the need to tackle ocean pollution and we are proud to have been a partner in making a positive impact,” said Anders Jacobson.